Am I a Disciple Maker? How can I know? In the opening verses of 2 Timothy 3, Paul warns Timothy concerning godlessness in the last days. The warning contains a sad list of the resulting realities of sin within a world filled with sin sick hearts. The list includes love of self and money, pride, arrogance, heartlessness, slanderousness, treachery and reckless behavior, among others. He encourages Timothy that the people he has described “will not get very far, for their folly will be plain to all…” (v. 9). Perhaps this should encourage us in a day that many believers feel incredible pressure to compromise the truth in order to be accepted. Notice the personal nature of Paul’s admonition to Timothy. He doesn’t simply offer Timothy abstract ideas that he should have picked up along the way. He points not only to the Scriptures, but more importantly, the demonstration of his life as he has lived out those principles before Timothy. Paul is able to remind Timothy of a relationship that has been filled with intentionality in discipleship. Paul’s lessons to Timothy include not only words spoken and read, but an example lived and practical lessons taught. My goal a couple of Sundays ago was to teach through the closing verses of this chapter in order to share with my students how the Scriptures declare their own authority and function. As I read through all of chapter 3, though, I came to the conclusion that I must present verses 16 & 17 in their greater literary context within Paul’s letter. The Spirit’s conviction became more intense with each reading, asking the same question as I read and re-read: Who in your own life could you encourage with these same words? Isn’t this the essence and aim of making disciples? Could not this same question be asked of every person claiming to be a follower of Jesus? Jesus commanded every believer to make disciples in the Great Commission. What is the end result of making disciples? 2 Timothy 3 offers us a picture as an answer to that question. Paul’s encouragement to Timothy in light of the coming ‘difficulty’ is the culmination of a process of intentional discipleship. This statement exudes confidence, not in Paul’s own ability, but rather in the hard work of pouring into a life through the enabling of the Spirit and in the gospel transformation that has taken place in that life through the process of an intentional discipling relationship. Only then, after admonishing Timothy to reflect on Paul’s life and leadership, does Paul remind Timothy about the sacredness, universality, and authority of the Scriptures. They provided not only the foundation of his discipling of Timothy, but also for Timothy’s continued growth, as well as his own ministry of discipling others. Paul is reminding Timothy that they not only are the source of Truth, but also the necessary foundation for the relationships God has commanded us to have with one another for the gospel’s sake. Plainly stated, if we truly believe verses 16 and 17, then we will be intentional about discipling others through the Scriptures! Without the rest of chapter 3 I may be prone to read these verses as only how the Scriptures function in my own life. But the rest of the chapter offer a picture of how they have not only functioned in Paul’s life, but also how they have functioned in Paul’s relationship with Timothy! Paul can be confident in the outcome that Scripture can have on a life because he has seen the way it has shaped Timothy’s life through his ministry to him. Paul knows that the end of his life is imminent as he pens these words to his beloved child in the faith, but he can face that reality with great joy and confidence knowing that his work in Timothy’s life has not been in vain, and that Timothy will then continue that work of multiplication through his own ministry to others. What about you? To whom in your life could you say these words? We face the reality of what Paul described in the opening verses of this chapter. Who can you encourage in the midst of it by reminding them of the reality of the gospel they have witnessed in your life? Who are you intentionally pouring into by teaching, reproving, correcting, and training according to the Scriptures? Remember, Jesus gave the Great Commission not just to pastors and church leaders, but to all believers. This passage has become a litmus test for me, so to speak. How do I know if I am intentionally pursuing the Great Commission? Who can I identify in my life as those to whom I can offer this same encouragement as Paul gave to Timothy? Every believer should be able to answer this question, identifying both people in the past as well as people in the present. Further, we should then be intentional to ask the same question of those we have poured into, and so on and so forth. That is the essence of multiplication! By the way, the most difficult aspect of discipleship can be knowing what tools to utilize and where to start! Trust me, I have had the same struggle. I want to point you to two fairly new incredible resources you can use, one of which I have read recently. Its encouragement actually had much to do with my thoughts I have shared in this post as I read through 2 Timothy 3. That one is called Growing Up, by Robby Gallaty. 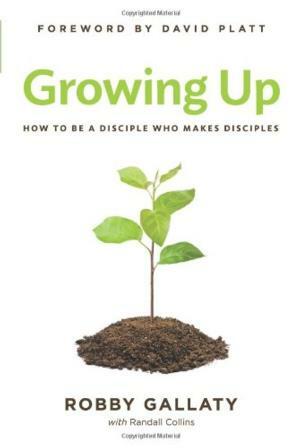 It is really well written and offers a very simple, yet effective, way of developing discipling relationships. The second one has now been out for a while and is entitled Multiply, by Francis Chan. Either one of these excellent resources would be a great and encouraging way to start being intentional about pursuing the Great Commission. You can click on either image below to purchase on Amazon.